Aluminum gutters are the perfect option for many homeowners. Aluminum gutters are affordable, durable, and easy to customize with the styles and colors of your choice. 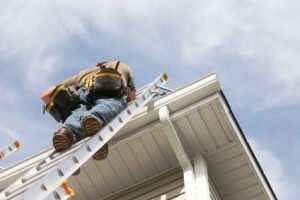 If that sounds like a gutter system that could be right for you and your home, then Minnesota Leafless Gutters can help you work out the finer details. We’ll help you understand the many advantages of aluminum gutters – as well as the disadvantages that can come with this gutter material – talk you through your gutter style options, and help you make an informed decision when choosing your gutter system. Our St. Paul, MN aluminum gutter contractors are here to help, providing you with all of the information and resources you need when choosing your gutters and ensuring that aluminum gutters really are right for you. One of the most important things you should know when choosing your gutter system is what the advantages and disadvantages of using a certain material may be. If you’re looking into installing seamless aluminum gutters, you’ll be happy to know that aluminum gutters are the most affordable gutter option – other than vinyl. However, aluminum (unlike vinyl) has the added advantage of being durable and weather-resistant. In fact, our gutter contractors do not install vinyl gutters because they simply are not durable enough for Minnesota weather. But with aluminum gutters, you can look forward to having a gutter system that’s resistant to rusting and corrosion and can last for 15 years or more if maintained. How is this possible? We install extra durable aluminum gutters by offering seamless gutters, a gutter system that allows for less debris blockages than more traditional gutter systems, which means fewer leaks and areas with damage – and far less time spent cleaning your gutters! Another advantage of aluminum gutters is that you can choose virtually any gutter options, selecting the gutter style of your choice as well as choosing a custom gutter color to match or complement your home. If you’d like to make your gutters more than a necessary feature of your home and turn them into another accenting fixture to enhance your home’s aesthetic, you’re in luck. At Minnesota Leafless Gutters, we install custom aluminum gutters that can be customized to your specifications, ensuring you love the look and style of your gutters. You’ll have hundreds of colored finishes to choose from that can be used to match your home’s color scheme or create a contrasting coloring that makes your home stand out. In addition, you’ll be able to choose between k-style and half round aluminum gutters, a decision that will play a role in determining how durable your gutters are in addition to how well they clean themselves. To learn more about our custom aluminum gutter options or to find out which aluminum gutter style might be right for your home, contact our St. Paul, Minnesota seamless gutter contractors today at (612) 221-0362, or email us at mnleaflessgutters@gmail.com.